Limited spaces for this workshop! Enroll NOW to ensure your participation! Join master painter and workshop instructor Laurie Meyer in the inspiring villages and natural environment of Italy's Cinque Terre region! Add strength to your composition, excitement to your brushwork, and learn to see and mix fresh color in the breathtaking light of the Cinque Terre villages and landscape! Come. Taste the rich atmosphere and paint in a land where other great artists have been inspired for centuries. Register early. Class size is limited to 15. US$2999.00 per person single occupancy. *All-inclusive plans are Pensione Sorriso plans only. the suggested arrival and departure airport in Italy. we suggest to pack light. Paint with Laurie Meyer and capture the adventures of plein air painting colorful landscapes in the beautiful and picturesque Cinque Terre area of Italy (a UNESCO World Heritage Site). Discover how painting from life helps us to see and observe the affects of light and atmosphere. The entire painting process will be covered along with daily demonstrations. Laurie will work individually with each student at their easel and guide them at their own level. This workshop is for anyone interested in learning to develop creative, painterly paintings with clean, rich color, mood, and dynamic compositions. -08:16a - Morning departure from Vernazza. Note: Toscana Americana reserves the right to alter this itinerary. 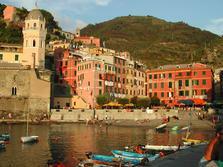 All times are approximate .Note: travel from Vernazza within the Cinque Terre towns is by train and/or boat. Depending upon timetables, etc. Five miles of rocky coast in eastern Liguria, two promontories lie at each extremity, thousands of kilometres of dry walling, cultivated into vineyards, five southerly villages castled up on spurs of stone or disposed in clusters of very small inlets. These are the co-ordinates of the Cinque Terre (Five lands) and the villages of Riomaggiore, Manarola, Corniglia, Vernazza and Monterosso. The area is now a National Park and since 1997 a UNESCO protected territory as a system of naturalistic environmental interest. This zone is characterized by the presence of precipitous slopes which have been cultivated into vineyards by means of fatiguing system of terracing the only evidence of transformation operated by the laborious human activity on the territory. 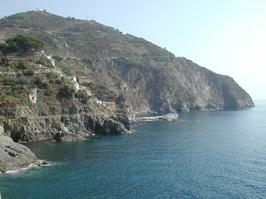 The suggestive type of coastal projections on the sea with sheer cliffs that often overtake the verticality alternated with bays, winding paths and enchanting small beaches between cliffs with a profound back drop, a rich variety of ichthyic (fishing) all of which make this district an authentic natural "opera of art".